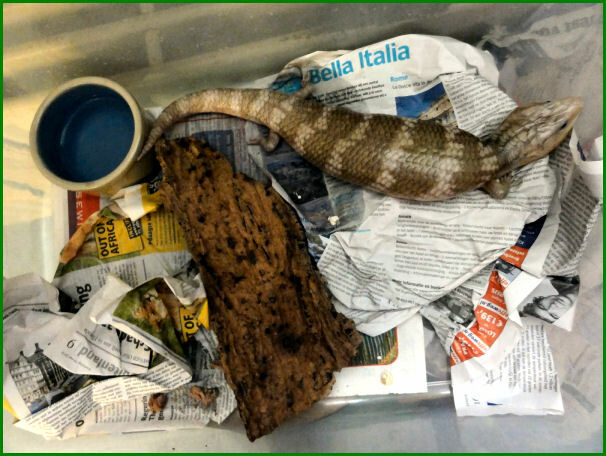 In the basement of the reptilezoo there live some Blue-tongued skinks (Tiliqua scincoides). Every year there are a number of young born in this terrarium. Other zoos have no intrest in these young and this means that they have to live for a long period (sometimes for years) in the quarantine of the reptilezoo. This would not be that bad when these animals had a decent terrarium to live in. But, this is not the case. 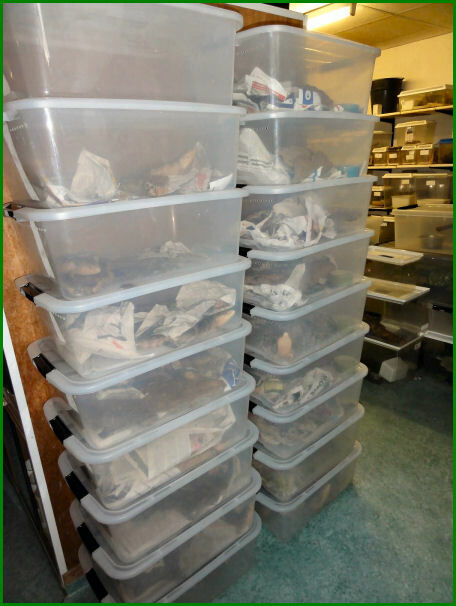 These animals have to live in plastic boxes with the following measurements: 30 x 20 x 15 cm (BxDxH). Tiliqua scincoides: no room to move for a long period! What you see is all the room they have! There is no additional heating or illumination present except that the boxes get some light from a small window. Temperature in the boxes is "roomtemperature" which is in this case 24 degrees Celsius. It is obvious that these animals barely have room to move. Next to that is their main food catfood. No good circumstances for animals that easily get to fat. The last time I saw the young in the plastic boxes were between 25 and 30 cm long! All this animal cruelty could be prevented when they remove the male from the females in the exhibition-terrarium in the basement.